Kidderminster was internationally renowned for the carpets woven here. The Museum looks at the history, heritage and the people that worked in the industry. See large working looms, great interactives and a fabulous shop! Well connected by road, rail and public transport, the Museum of Carpet provides an excellent venue in the heart of Kidderminster. 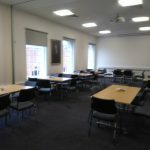 With excellent conference facilities, modern meeting rooms, and activity space for art groups or children’s activities, the Museum hosts a variety of room hire options – for more information see ‘Room Hire’. Celebrating the local carpet trade that made the town famous the Museum of Carpet hosts daily hand loom and power loom demonstrations, hands on activities and displays over 300 years of Kidderminster’s history in interactive and informative exhibition halls. Every Monday 10:30 – 12:00 the Museum hosts ‘Weaving Tales’ a friendly, fun and supportive group for those living with dementia and their carers. Each week there is a different activity based on the museum collection. All are welcome. This July the Museum will unveil its 2018 Summer exhibition ‘Journey to Japan’. The exhibition will feature the Museum’s extensive collection of beautiful Japanese ink paintings and stencils. The fine and delicate stencils, believed to be from the period 1841 – 1921 provide a breath-taking insight into design and patterns of the period. In addition to the exhibition the Museum has organised a number of accompanying Japanese events running from June – September, commencing with a Japanese Garden Visit and concluding with Childrens Japanese arts and craft activities. For more information visit the Museum’s What’s On Page.